I'd purchased one of the original Wacom Graphire tablets a long, long time ago and it served me well. I remember I'd tried a different brand first because it was cheaper but returned it immediately because writing on it felt like crap. The Graphire had a very natural pen on paper feel which I liked a lot. As I said, that was a long time ago. The buttons had fallen off the pen and the surface was heavily scuffed and, let's face it, it was the only patch of light blue in my manly, all-black office space. An upgrade was in order. So a couple of months ago I decided to try one of the new Bamboo Fun models. I simply can't justify the expense of the large Intuos tablets for myself (though I'd love to have one if you, kind reader, are feeling generous). 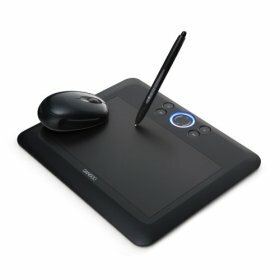 The Bamboo line from Wacom essentially replaces the old Graphire line except for the Graphire Wireless 6x8. The Bamboo comes in two models: The Bamboo Fun and the Bamboo (business version). They are identical except that the Bamboo Fun comes with a wireless mouse and with some old software: Adobe Photoshop Elements 5.0 Win/4.0 Mac, Corel Painter Essentials 3.0, and Nik Color Efex Pro 2.0 GE and costs $20 more. But, you can get a Bamboo Fun in two sizes while the Bamboo is only available in small. While I didn't need the outdated software, I did want the larger size tablet, which is why I chose the "Fun" version. If you just want the small size and don't need the software or the wireless mouse, get the Bamboo and save some cash. The medium Bamboo has a drawing area approximately twice the size of the Graphire I'd been using (8.5 by 5.3 inches)---very nice. It's got four programmable buttons and a nifty little iPod-like wheel nestled between them. It doesn't actually spin or move but it senses circular motion of your fingertip and is useful for functions like scrolling, zooming, and adjusting slider knobs. The wireless mouse is a standard two button job with a clickable scrollwheel. It only operates on the tablet itself, just like the pen. The pen is nicely balanced and doesn't feel too light or too heavy. It has a writing tip and an "eraser" so you can use both ends. For those of you who've never used a tablet before it works like this: your software remembers which tool you last used with each end of the pen. So when you flip it over it automatically switches between them. So one end could be a pen and the other the eraser. Or an airbrush. Or whatever. It's handy. And I don't know how they do it, but the eraser feels like an eraser and the pen feels like I'm writing on paper. It's weird (in a good way). There are two buttons on the pen which are essentially the same as right-click and middle-click on a mouse. You "left-click" by touching the surface of the tablet. The tablet is also pressure sensitive to 512 levels. My only knock against it is that I wish the pen holder was integrated into the tablet itself. Instead, it's a separate chunk of plastic. Oh, and also, it purrs. After a few seconds of inactivity, the blue ring LED around the scroll wheel dims and brightens rhythmically... like it's breathing slowly, soundly asleep... or watching you malevolently like the icy blue eye of death. Cool? Maybe. All in all, it's a good tablet and I enjoy it immensely. For working with photographs, the precision and ease of a pen beats a mouse any day. The pressure sensitivity allows me to alter the brush size or opacity just by pressing harder or lighter on the tablet as I draw. Combined with the natural feel of the pen, this allows me to make photograph alterations involving hand-drawn layer masks and dodging/burning with ease. Actions that would have required multiple brush size changes, opacity changes, and tons of clicks of a mouse can literally be done in a single stroke with a tablet. I highly recommend getting a tablet if your mouse makes you frustrated while editing photographs.